JAFF is short for Japan Food Festival, a month long celebration in collaboration with JETRO and Japan Centre where we offer an insight into locally produced food from all over Japan. With such a huge variety of different food produced in the different prefectures of Japan, we want to introduce you to some of these and explain about the culture and background behind them. Of course we also have lots of these specially selected local foods available at Japan Centre to sample for free too! This month, we focus on the unique food and drink of Nagasaki Prefecture in Kyushu. Nagasaki is one of the largest cities on the southern island of Kyushu, one of the four main islands of Japan. Nagasaki has long been the international hub of Japanese trade as it was the only shipping port open during Japan’s “Sakoku” period of 1639 to 1853, when all foreign trade was prohibited. This means that Nagasaki has a wide range of Western influences ingrained in its culture, as well as a great variety of unique and interesting food and drinks. That’s right, come and visit us at Japan Centre in regent Street any day from now until the 27th February between 3pm and 7pm and taste some of the glorious food from Nagasaki. 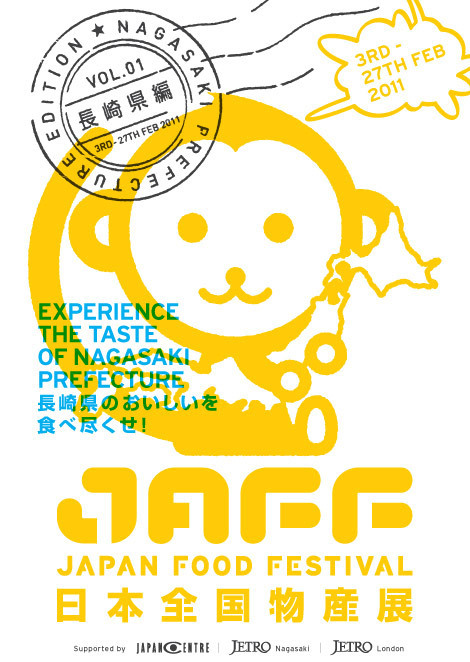 Posted in Food and tagged events, in-store tastings, JAFF, Nagasaki. Bookmark the permalink. so what exactly is the food on offer? Happy to find my favorite food! Kankoro mochi!!! Slice and toast it slightly,,,Mmmm Yummy!! A Japanese Diet for 2011?